HRV is also of great value in determining the degree of progress in many clinical diseases (for example, diabetes, hypertension, thyreotoxicosis, leukemia, different types of oncological diseases, etc.). For this reason, HRV has escalated in use as one of the best diagnostic instruments in contemporary medicine. The practical application of the method, in ecological and professional aspects, requires software and hardware facilitation. BioScan products encompass these theoretical and clinical studies with a proven methodology for patient monitoring, tracking and assessment. In recent years, ANS/HRV has successfully been used to assess the negative influence of a wide spectrum of stressors including environmental pollution, dietary problems, psycho-social discomfort, and different behavioral disorders. BioScan monitoring has been developed according to the standards and mathematical procedures for short-term HRV Autonomic nervous system (ANS) analysis as well as for performing and evaluating pulse flow and autonomic challenge tests. 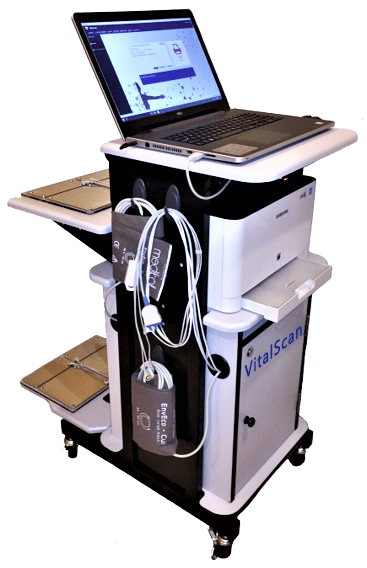 BioScan Pulse Wave Velocity measurement is a convenient method of quantifying arterial stiffness and augmentation. PWV provides invaluable insight into cardiovascular health, management of disease progression and monitoring the effects of medication, treatments, lifestyle and dietary habits.